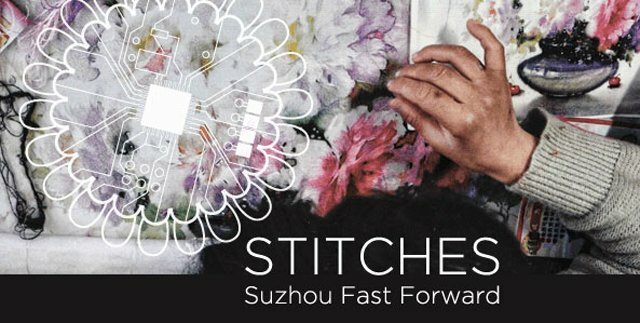 STITCHES: Suzhou Fast Forward Exhibition | Williamson Williamson Inc.
STITCHES: Suzhou Fast Forward, features seven pieces of hand-crafted embroidery from the Zhou XueQing Embroidery Art Center in Suzhou, China. Dexterously stitched in fine silk threads, these exquisite pictures represent an array of subject matter including flowers, birds, and landscapes, continuing Suzhou’s 2000-year history of embroidering illusionistic scenes. Believing that this ancient craft could be the springboard for experimentation, resulting in contemporary expressions of what embroidery might be in the 21st century, WORKShop invited a small group of architects, artists, designers, and inventors to create original works. Inspired by the Suzhou tradition, they employ new technologies, processes, and materials, resulting in objects that range from purely decorative to highly functional.